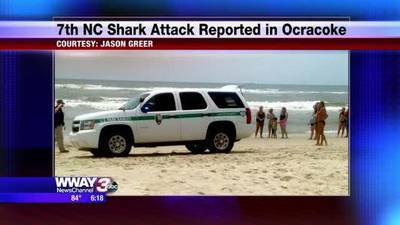 A 68-year-old man was pulled under the water by a shark Wednesday in the Outer Banks — this time on Ocracoke Island. The man was swimming outside the first breaker about 25 feet offshore, directly in front of the lifeguard stand, when he encountered a gray shark about 7 feet long, Hyde County officials said. A lifeguard saw the shark pull the man under the water. He suffered several bites to his rib cage, hip, lower leg and both hands. A witness told CNN he saw a “trail of blood from water to the sand.” Wednesday’s attack marks the seventh incident on North Carolina beaches in June and July.